Smartwatches are everywhere, so why are they still winding people up? LG and Samsung have released so many types of smartwatch of late you'd think everyone on the planet had at least eight arms - and that people actually cared about smartwatches. Although this week in smartwatch news, things did get a little interesting. LG discovered a new kind of shape. It's a bit like a wheel, sort of curved at the edges, and looks round. The press release said it was a Circle(TM). The LG G Watch R, complete with a serious-looking diver's watch face, converted quite a few Moto 360 fans to LG's wearable cause in a flash, although debate turned to how exactly LG's engineers manage to manipulate the bezel to mask the corners of the square display beneath. Some people felt they're being ripped off by having the corner of the square screen hidden from them, which is a little odd. Samsung also announced its Samsung Gear S this week, a smartwatch that curves along the other axis, bending around the wrist like a bracelet. Ideal for all those top fashion models who fancy trying out the Tizen OS. But is any of this enough to convince the world that a watch with a battery that only lasts a day or two, and functions like a stripped-down version of the mobile phones we already own, is a good idea? Looking quite like a normal watch is a strange selling point for a gadget, what with normal watches that look exactly like watches not exactly short on the ground. 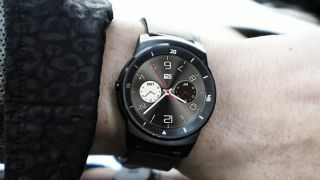 Beneath a piece on The Verge in which a writer spent 529 words saying he didn't like the look of LG's latest watch-like smartwatch very much, reader Wingzero0 hit incisiveness gold with: "If nothing else, it'll give Apple a template on what people like and don't like and they can go from there." After some tedious back-and-forth about Nexus 5 battery life and fights about who's a stupid fan of what, discussion returned to the standard watch and the status these ancient, non-smart wearables once inferred on the wearer. After someone claimed no proper watch enthusiast would consider a smartwatch, reader Pyrolys replied with: "Sorry, but you don't get watches. The 'rebirth' of the automatic watch is due to the renewed interest of people in the craftsmanship it involves. Phones have never been about that." Reader Decmir is also on the side of things that tick because of cogs rather than due to speakers, saying: "It's OK to buy a new phone every two years. It's also OK to die wearing the watch you were offered at twenty. Personally I'll stick to analogue timepieces!" Meanwhile, Samsung's tech announcement of the week was the Gear S, the Tizen-powered gadget it's using to target the sporty crowd. On the Guardian, no one was impressed by its size, with even this second-generation of slightly slimmer, curvier screens not going down too well. Commenter Nuspeak said: "I think they are all too big, too ugly and with too poor battery life. I think we are a number of generations, possibly 2-3 years away from something that will break the mass market." To which ageing reader SugarPlumpFairy replied: "Remember the first digital watches in the 70s? They were huge; you had to lift your wrist with your other hand to see the time. I'm sure I still have one shoulder higher than the other." Reader Threlly thinks Samsung and LG are simply pumping this stuff out there now before Apple steps up and owns the market, posting: "I sense a rush to get products out before Apple come along on the 9th and crush them like bugs." Apple Insider poked its nose in again this week, using the Samsung and LG launches as a way to get its readers slagging them both off to create a riot of page impressions. Reader Nagromme doesn't seem to think that even Apple can solve the issues currently dogging the wearables scene, though, belittling the devices with his questions: "Screen always visible (without weird twitches or gestures) or not? Battery life for days, or not? If those don't have good answers, then chasing the 'watch' concept is barking up the wrong tree." Perhaps some sort of kinetic self-charging option might be an option? Imagine the amount of physical activity the wearer would need to get up to in order to keep a smartwatch charged. It could single-handedly end the obesity crisis. Reader jkichline, meanwhile, is not overly won over by Samsung's wearable aesthetic, saying: "I'm not sure who Samsung is designing for. Buzz Lightyear perhaps? Does it come with a laser weapon too?" And what of the so-called iWatch itself? Beneath a Gizmodo thing about the trillions of vague rumours and Apple wearable patents that have popped up of late, the knives are already out and attempting to dent the iWatch's rumoured sapphire glass display. Reader Jonny Smyth leapt in with both feet, commenting cynically: "It'll be overpriced, underpowered and totally not worth it, but the Apple fanboys will defend it anyway." To which The Artgineer responded: "People will claim it's overpriced, underpowered and totally not worth it before it's even announced, if it even exists." Commenter The Terminator doubts smartwatches will ever become popular, as their features won't have the same timeless appeal of their non-smart forefathers. He commented: "A deal breaker for me would be a non-replaceable battery. Unlike mobile phones, watches are meant to last the test of time (no pun intended) as they represent fashion and have a nostalgic appeal. They're not meant to be thrown out with every new iteration." This is presumably why Apple's not done one yet. What's the benefit to a tech company in making a gadget that you don't have to replace with a new one every 18 months? Inflame is TechRadar's weekly look at beneath the fold.